US President Donald Trump has arrived in Scotland as thousands of demonstrators gathered to protest his visit. 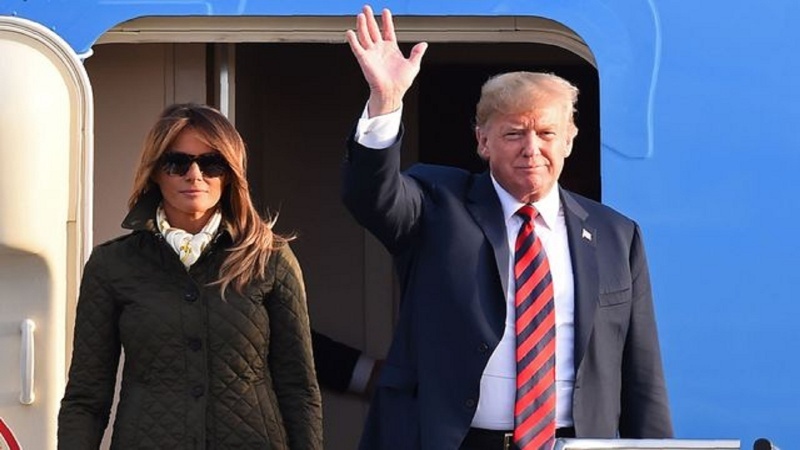 Trump touched down at Prestwick Airport Saturday evening after paying an official visit to London, where he met with Prime Minister Theresa May and Queen Elizabeth amid huge protests. People held a rally in Glasgow ahead of Trump’s arrival. The US president will spend the weekend at one of his private golf courses in Turnberry, preparing for his Monday summit with Russian President Vladimir Putin. Trump, whose mother was Scottish, owns two championship-level golf courses in Scotland, including the seaside resort of Trump Turnberry on the country’s west coast. “The UK and the USA a have long and important relationship – we have close cultural ties, a strong economic partnership and the US is one of our most important security allies,” the conservative politician said. The carnival will feature the giant nappy-wearing “Trump Baby” blimp, which has been banned from both Turnberry and the Scottish Parliament. Thousands of protesters also marched through the streets of London as Trump met May and the Queen earlier on Friday. While in London, Trump described Brexit as an “incredible opportunity,”hours after telling The Sun newspaper that the prime minister’s compromise plan to leave the European Union may “kill” any trade deal between the UK and the US.